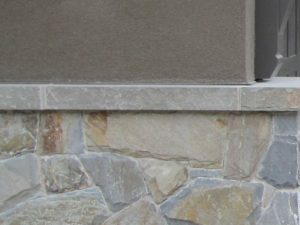 Quarried in Northwest Montana, our Castle Rock Ledge Stone veneer can dress up any style of architecture – from warm and rustic to cool and contemporary. Applied inside or outside, this natural stone product brings texture and visual interest in cool tones of grey and brown with touches of warm copper. This material has a traditional ledge stone shape, with clean rectangular pieces, the stones range from 2" to 8" face heights and 3" to 18" lengths. Our Castle Rock profile produces a strong, dramatic look, that emphasizes the linear flow of modern design. 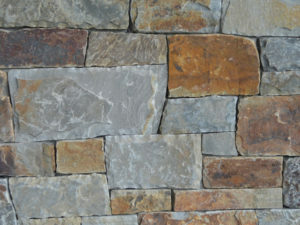 Natural stone veneer can be used on home exteriors to add character and harmonize disparate elements. Apply it to chimneys and eaves, or on other architectural features to highlight and define them. It can enhance the exterior of a home by applying it to the front door, or on porticoes, columns and retaining walls to create a striking main entrance way to your home. Continued around the property as part of a landscaping design, Castle Rock Ledge Stone veneer lends practical charm to outdoor kitchens and cooking areas. It's also great for defining planting beds, pathways and other elements such as gateposts, walls and outdoor living spaces. Inside the home, stone veneer is a natural for fireplace surrounds in the living room or recreational areas. Extend it to the ceiling, following the line of the chimney to draw the eye upwards, emphasizing height. 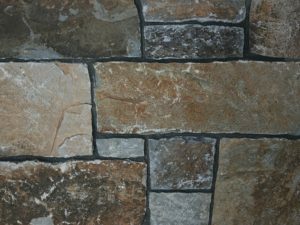 Castle Rock Ledge Stone can also be used to add glamour to transitional spaces such as front foyers, hallways, stairwells and landings. Or consider establishing a spa-like ambiance in powder or bathrooms by using it on shower enclosures or around the sink. A little can go a long way. 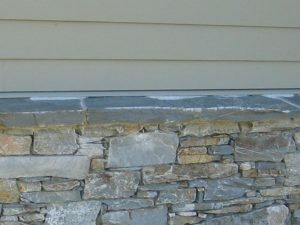 Builders and designers love natural stone veneer products such as Castle Rock Ledge Stone for the organic warmth and drama it adds to any style home. Due to how easy it is to work with, DIYers love it just as much.